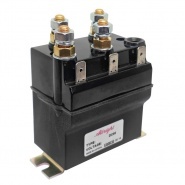 Albright International DC66 series of motor reversing 80A solenoids, double acting DC66 series of compact contactors, following the established design of the SW60 mono-block solenoid that is configured specifically for motor reversing. The DC66P motor direction switching solenoids, sealed to IP66, have many versions available for Scheduled Maintenance and Production Run lead-time ordering. 12 volts very intermittent DC66P-72P HO, for small battery powered winches, vehicle mounted cranes and small electric vehicles. 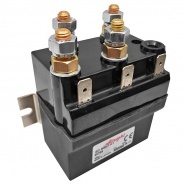 The DC66P-19P is a very intermittent contactor ideally suitable for use with small battery powered winches, vehicle mounted cranes, etc. The DC66P-1P is ideally suitable for use with small battery powered winches, vehicle mounted cranes and ramps, etc. 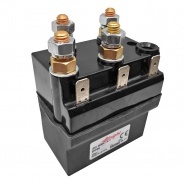 The DC66P-40P is ideally suitable for use with small battery powered winches, no bracket it fitted. The DC66P-9P is ideally suitable for use with small battery powered winches, vehicle mounted cranes, small electric vehicles, etc. The DC66P-11P is ideally suitable for use with small battery powered winches, vehicle mounted cranes, small electric vehicles, etc. DC66P-10P, ideally suitable for use with 24V small battery powered winches, vehicle mounted cranes, small electric vehicles, etc. DC66P-15P, ideally suitable for use with 24V small battery powered winches, vehicle mounted cranes, small electric vehicles, etc. 24 volt very intermittent DC66P-73P HO, for small battery powered winches, vehicle mounted cranes and small electric vehicles. The DC66P-14P highly intermittent contactor is ideally suitable for use with small battery powered winches and vehicle mounted cranes, etc. The DC66P-38P very intermittent solenoid is ideally suitable for use with small battery powered winches, vehicle mounted cranes, etc. The DC66P-3P HO is ideally suitable for use with small battery powered winches, vehicle mounted cranes and ramps, etc. DC66P-31P, ideally suitable for use with 24V small battery powered winches, vehicle mounted cranes, small electric vehicles, etc. 48 volt very intermittent DC66P-93P HO, for small battery powered winches, vehicle mounted cranes and small electric vehicles. 48 volt intermittent DC66P-21P, for use with small battery powered winches, vehicle mounted cranes and small electric vehicles. 48 volt continuous DC66P-34P, for use with small battery powered winches, vehicle mounted cranes and small electric vehicles. 48 volt prolonged use DC66P-33P, for use with small battery powered winches, vehicle mounted cranes and small electric vehicles.